In this third instalment of research reviews on the battling ropes, we are going to look at a study which looked at the effects of battling rope training on aerobic fitness and baseball pitching performance. Given, that the traditional approach to in baseball has been to use running based programs to improve fitness, the authors of this study hypothesised that running, may not adequately condition the upper body for the demands of pitching, which requires upper body endurance and power. What they measured: Upper body and lower body aerobic fitness, pitching speed and pitching stamina. How they did it: The battling rope program below took approximately 24 minutes to complete and incorporated 7 different exercise stations, which was completed twice, in consecutive order. The interval time started at 30-seconds and built up to 45-second intervals over the 4-week period. Interestingly, for sport specific reasons, the active recovery involved a 41 meter run that needed to be completed in <10 seconds, with a light jog making up the remaining 20 seconds. The running group performed three sprint/jog interval sessions per week. What they found: 4-weeks of battling rope training significantly improved upper body aerobic fitness and arm power output. There was no improvement in lower body aerobic fitness or pitching speed or stamina. 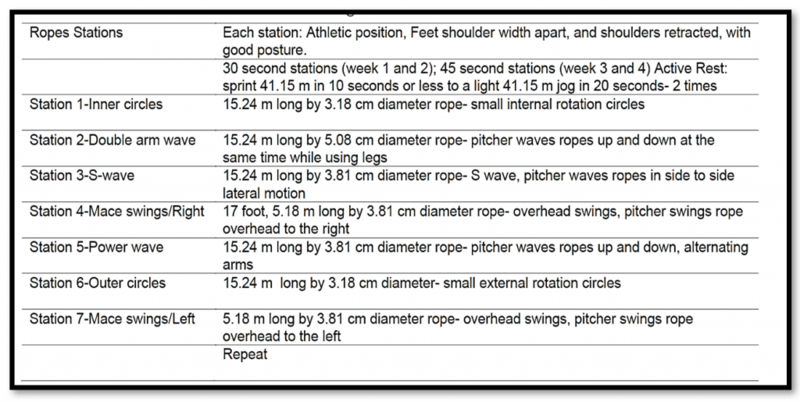 What does this mean: Battling rope training effectively increases upper body fitness and metabolic conditioning in baseball pitchers, however because many of the same muscles used in pitching are also used in the exercises performed with the battling rope, caution must be taken not to overtrain these muscle groups with the additional requirements of baseball training and competition. Thus, a 3-day a week battling rope training program may be more appropriate in the off-season, where throwing volumes are not as high. Had the authors of this study conducted this program in the off-seasons, more favourable results on pitching performance, may have been observed. Reference: Kuklick, C. R., Martino, M. A., & Black, C. D. (2010). Throwing Velocity and Stamina in Baseball Pitchers as a Function of Training Methods (Doctoral dissertation, Georgia College & State University).